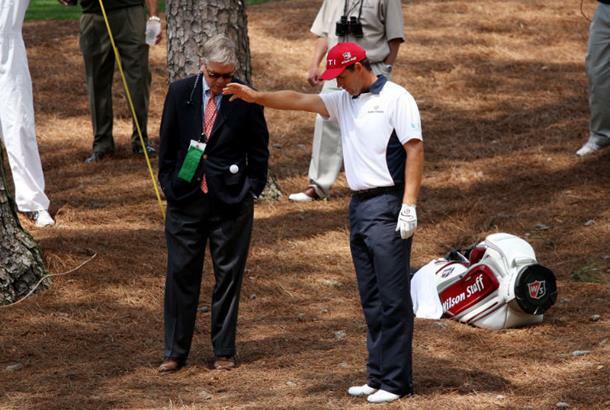 It's 'moving day' at The Masters but the only thing Padraig Harrington was moving early in his round were the azaleas! On the par-5, second he hoiked his tee shot left into the trees. An aggressive second with a fairway wood saw him smash into a tree, his ball ballooning over his head and into the bushes. He found it, but it was unplayable and so he dropped out, Playing his fourth, he hit another tree and went back towards the bushes he'd just rescued his ball from. So, playing his fifth he finally got out (ish). His sixth shot came up just short of the green. A chip and two-putt later saw the three-times Major-winner card a nine! But Harrington is not one to lie down and give up. He kept playing and three birdies on the front nine saw him finish the outwards stretch just one over par. With the leaders nine under and expected to go low again today, the Paddy Slam looks dead and buried. Rory McIlory was another Irishman looking to bounce back. He treble-bogyed the 18th last night and was under investigation for a 'bunker incident' on the last hole. He was cleared and did not have to wait long to test his sand trap demons. On the second he went into the green-side bunker. A superb shot saw hime end with a birdie and move to level par. He didn't 'smoth' the bunker over this time! Ian Poulter is plugging away and is now one under with eight to play. Lee Westwood has moved to three under with the leaders on the course now. Keep uo-to-date with the latest drama from The Masters!